HID Global recently announced its FARGO HDP6600 printer, and we discussed the card printer/encoder for its impressive throughput capabilities. Now, the printer has been recognized for its environmentally friendly impact. In a release from HID, the FARGO HDP6600 High Definition Printer/Encoder is the first and only retransfer printing solution for ID cards to achieve GreenCircle certification. The printer’s power-efficient design enables users to save thousands of dollars in annual energy costs for large projects spanning many printers. The HID FARGO HDP6600 card printer. The HDP6600 printer delivers on this energy efficiency and sustainability through an optional wasteless lamination module that dramatically cuts the waste byproducts that other printers generate. The module cuts consumables costs nearly in half for printed and laminated cards. HID Global’s sixth-generation HID FARGO HDP6600 printer halves the time required to print the first ID card as compared to many alternatives, while doubling overall throughput to up to 230 cards per hour. The company also lauds the device for being easier to service and more flexible to use across a wider range of applications, all while being less expensive to operate with a lower printing cost per card. 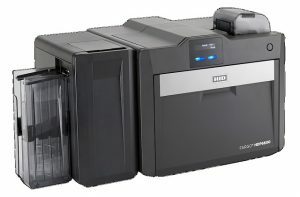 The printer offers true 600 DPI resolution with precision color panel registration for sharper text, crisper barcode edges and more vibrant colors than products that use dithering techniques and can only approximate this image quality.